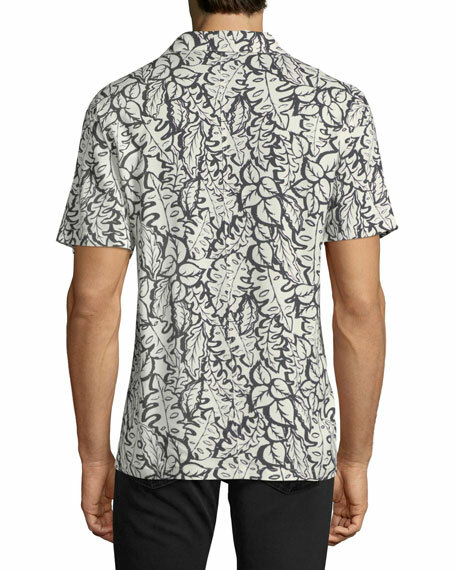 Ovadia & Sons beach shirt in leaf print. CALVIN KLEIN 205W39NYC shirt. Spread collar; button front. Short sleeves with logo embroidered on cuffs. Chest flap pockets. Classic fit. 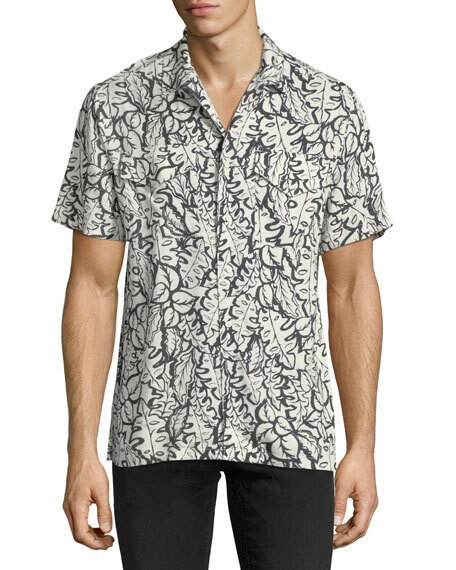 CALVIN KLEIN 205W39NYC shirt. Spread collar; button front. Short sleeves with logo embroidered on cuffs. Chest flap pockets. Classic fit. Cotton. Made in Italy. Model's measurements: Height 6'1"/185cm, waist 32"/81cm, typically wears size M.
CALVIN KLEIN shirt with graphic embroidery. Spread collar; button front. Rounded barrel cuffs. Oversized fit. Shirttail hem. Cotton. Made in Italy. Helmut Lang woven shirt. Approx. length: 28"L down center front, 30"L down center back. Spread collar; button front. Cap sleeves. Helmut Lang woven shirt. Approx. length: 28"L down center front, 30"L down center back. Spread collar; button front. Cap sleeves. Patch pocket at left chest. Slim fit. Straight hem. Cotton; machine wash. Imported of Italian material. Model's measurements: Height, 6'2"/188cm, Suit 38L, Shirt 15.5x35, Waist 32"/81cm, Inseam 33"/84cm.